J & J Snack Foods Handhelds of Holly Ridge, N.C.. is recalling approximately 56,578 pounds of stuffed sandwiches. The products that may be contaminated with extraneous materials -- specifically semi-transparent plastic. There are no reports of injury or illness from consumption of these products. 9-oz. 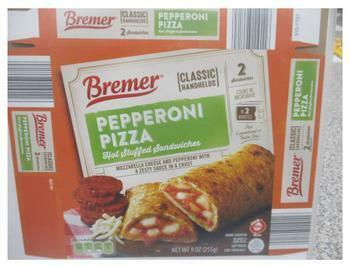 carton packages containing 2 stuffed pepperoni sandwiches with “Bremer CLASSIC PEPPERONI PIZZA Hot Stuffed Sandwiches” and best if used by dates of “AUG 12 2020” or “AUG 13 2020” on the label. 9-oz. carton packages containing 2 ham and cheese sandwiches with “Bremer CLASSIC HAM & CHEESE Hot Stuffed Sandwiches” and best if used by dates of “AUG 12 2020” or “AUG 13 2020” on the label. The recalled products, bearing establishment number “EST. 27231” inside the USDA mark of inspection, were shipped to a retail locations nationwide. Consumers with questions about the recall may contact Kristyn Castellante at (856) 532-6611.